Signed as a free agent on May 15, 2017. 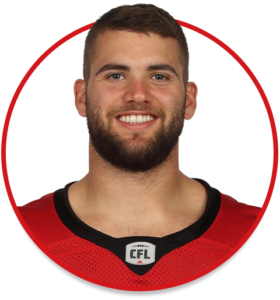 (Calgary) Jones played all 18 regular-season games for the Stampeders and recorded nine defensive tackles including one tackle for loss, 11 special-teams tackles and one fumble recovery. He had a career-high five tackles in a Week 2 game at Toronto. Jones had two special-teams tackles in the Western Final and a critical forced fumble on an Ottawa punt return in the Grey Cup game that helped the Stampeders secure a championship. (Calgary) Jones played 17 regular-season games including one in which he performed long-snapping duties. He had three defensive tackles, 12 special-teams tackles and two QB pressures. Jones was also in uniform for the Western Final and the Grey Cup. Jones played 34 games over five seasons (2012-16) with the UBC Thunderbirds. He accumulated 63 solo tackles, 79 assisted tackles, 1.5 sacks, 11 tackles for loss, two forced fumbles, one fumble recovery for touchdown, one interception and one blocked kick. In 2016, he recorded career highs with 20 solo tackles and 21 assisted tackles and he had 7.5 tackles for loss, 1.5 sacks and a forced fumble. In the Hardy Cup against the University of Calgary, he returned an interception 53 yards for a touchdown. Jones was a member of the Thunderbirds’ Vanier Cup-championship squad in 2015. Jones was a co-captain during his senior season at South Delta Secondary School.